Quest Protein Powder Review: Taste as Good as the Bars? I’m going to tell you a little something about my daily routine that you’re probably going to laugh at. But that’s ok. Because you surely do something equally as weird. After dinner, when I’m like 99% satisfied, but CRAVING something sweet and salty, I grab a tub of Ben and Jerry’s ‘Chubby Hubby’ and eat the entire thing. JK. I only do that on the weekends. *Frowny emoji*. No. When I have my life in order, I do not do this. Instead what I do is reach for a Quest bar. I usually opt for the Oreo/Cookies ’n Cream flavor because it’s phenomenal on it’s own, and because it’s part of my nightly dessert. Dessert. Two ’S’s’ because you want more. You don’t want more of a desert, that’s why there’s only on ’S’ in desert. You learn something new from me everyday don’t you? Of course you do. And now you’re going to learn something actually useful from me. Next time you’re craving something sweet and salty but don’t want to immediately gain four pounds and waste your last fifteen workouts, grab an Oreo Quest bar and a generous scoop of peanut butter. Slather a tiny bit of the peanut butter onto each bite. Thank me later. Ok now that today’s fun learning is out of the way, let me tell me about Quest’s efforts at making a protein powder. That first little bit was designed to not only give you a fun and fit new dessert idea, but also to convey a very important point. And that’s that Quest is the current King of the protein bar world. Ask almost anyone in any gym in the country what their favorite protein bar is. Yep. It’ll be Quest 9 times out of 10. The company has a great product. And by great I mean it tastes great. The nutritional value of a quest bar is kind of questionable to me because of how much sugar alcohol and fiber are in those things. I know fiber is good for you, but does anyone else feel like they ate a tree stump afterwards? What’s the impact of such a huge quantity of fiber on the body’s ability to digest and use that amount of protein? It’s a great question. I also question how healthy the versions with all the sugar alcohol are. It’s the same conundrum as the fiber. Is too much of a good thing really a good thing? Not sure. But I am sure that we’re going to start talking about the protein powder right meow. Let’s kick things off with the flavor. Does the protein powder compare to the bars on taste? I’m going to give the Quest Protein Powder a grade of 8.0 because, well, they just did not quite nail the flavoring of this powder the same way that they did with their bars. Maybe the shoes were just a little too big for Quest to fill. But the flavors that I tried, while some were better than others, just didn’t quite measure up. Don’t get me wrong some of them were good, if not great. But as you know from trying the Quest bars, almost all of those flavors are fantastic. There is a degree of flavor consistency that I personally have come to expect of Quest, and in my opinion they just didn’t really nail it this time around. Let me take you through flavor by flavor and let you know each scored on the BPW flavometer AKA my mouth. Chocolate Milkshake 9.0: Surprisingly to me- the most basic of the Quest Protein Powder flavors turned out the best. The chocolate is smooth and rich, with a good strong and authentic body. There is just the right amount of sweetness that makes you feel like you’re having a special treat more than a protein shake. The consistency was also on point with no clumping or settling. This protein blended very evenly for me. Vanilla Milkshake 8.8: The second biggest surprise was that Vanilla of all flavors took home the second prize for me. This flavor was also done tremendously well. It was the pure, almost minty sort of vanilla that I’ve always loved. It’s not a french vanilla- it’s much more oure in my opinion. The taste was sweet and had a super velvety smooth consistency. Big fan of this flavor. Peanut Butter 8.0: I know. Me. Allie Lewis giving a sub-par score to something bearing the legendary Peanut Butter name. Well, not subpar, but anything less than a perfect 10 is subpar for anything Peanut Butter. But it’s the truth. 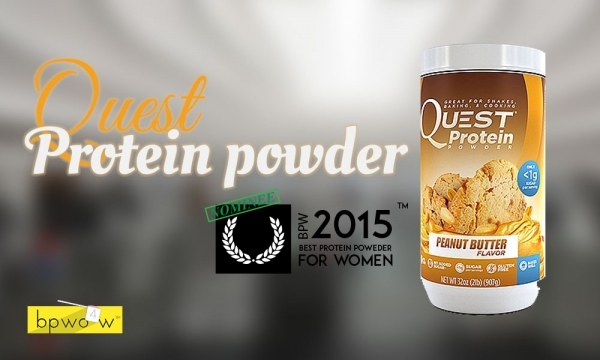 The peanut butter flavored Quest Protein Powder just isn’t that great. It tastes too much like that ‘fake’ instant peanut butter powder that you get when you’re pretending that real PB has too many calories. Not a huge fan of this flavor. Strawberries and Cream 7.8: The trend with the Quest Protein Powders is that the more fancy the flavor is, the worse it is. That’s certainly the case with Strawberries and Cream. This flavor was really unpleasant in my opinion. I’ll be honest I’m not the biggest strawberries and cream fan in the first place, but this one really rubbed my taste buds the wrong way. The level of artificialness in this flavor was way higher in this flavor than in the others, which really prohibited me from getting much enjoyment out of this one. If you’re wondering what’s the best flavor of Quest Protein Powder- you are best off going with Chocolate or Vanilla. When in doubt keep it simple, right? Right. Great transition into the ingredients portion of the review! I’m giving props to Quest on the formulating because they did a good job keeping things simple. Protein supplements these days can turn into these big nasty blends with ingredient panels over 50 lines ling, and they end up being overall a pretty crappy product. A perfect example of this would have to be StrongGirl Isolate, which I reviewed on Monday. Quest is the anti-StrongGirl-Isolate: using just whey, casein, and milk proteins to complete their 22g of protein per serving blend. Speaking of which- 22g is a really nice number for me. My body is happiest with, and responds best to about 20-25 grams of protein at a time, which makes the Quest Protein Powder a nice fit for me personally. Outside of those main protein sources, the only other things listed here are the flavors, sunflower lecithin, xanthin gum, cellulose gum, Stevia, salt, and Sucralose. What those ingredients do is thicken up the shake when you mix it, and of course enhance the flavor with sweetness and saltiness. That’s pretty much all I have to say about the formula. It’s super simple and therefore really nicely put together. Props. Let’s talk packaging. There is something to be said for brand consistency, and Quest has done a nice job in keeping their ‘look’ consistent from the bars to the powder. No thats’ not a drug reference. Let’s look at the Vanilla flavored label for example (pictured in the graphic above). What I like most about this package is how prominent Quest made the vanilla ice cream graphic. I mean. This just screams out to you ‘taste’. I want to take a spoon and try and pry some of that deliciousness right off the label! That’s how you know that it’s an effective design. You’ve triggered an emotional response. In my case it’s not that hard to do. My mind is always going to freak out when it sees ice cream and make me act impulsively. Shutup you’re the same way. LOL. What else. The blue that they chose also goes super well with the overall flavor and theme. You’ll notice that each flavor has it’s own color palette, which I also really dig because they took the extra time to match up the tastes to the colors of that flavor. The callouts are clear and the overall layout is exceptional, which makes for a terrific and seamless experience overall. Awesome job as always to Quest in the packaging department.